The Addison's Tales musical storyworld launches into bookshops around the world with this incredible story of a half-fairy Dreammaker down on his luck. 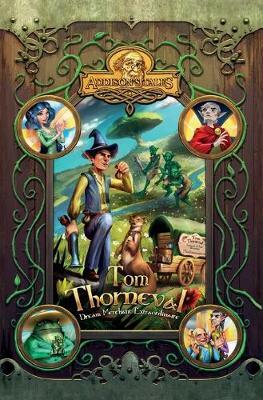 "Tom Thorneval - Dream Merchant Extraordinaire" is a rippingly entertaining anti-fairytale that follows the misadventures of a very likable Dreammaker who stubbornly persists on making it big in the world of men. Unfortunately, such a bold intention for a Dreammaker has drawn the ire of Fate, and Tom is robbed of all his dreams shortly after setting out on his grand adventure. With his loyal (if slightly insane) stoat Wix, a devastated Tom battles on through one horrifically funny misfortune after another as he makes his way towards what he hopes is the Grand Goblin Fair, only to draw further and further away from it in the process. Will the courageous half-fairy make it back to his true love Mary? Will she be waiting for him? Or will all the orcs, imps, witches and mysterious creatures that line the paths to the fair ruin his one chance at happiness? The answer lies in the pages of this innovative literary event that pulls readers through a Pythonesque world of music, color and breathless adventure.Readers are invited to listen to the songs from the storyworld with their smartphones, send Tom down specific paths and even guess the real nemesis behind all his bad fortune. And if that weren't enough, readers can even learn the uber-catchy, author-composed melodies at the Addison's Tales channel on MuseScore.com. No wonder Tom Thorneval - Dream Merchant Extraordinaire has already been dubbed as the next chapter in the art of storytelling.